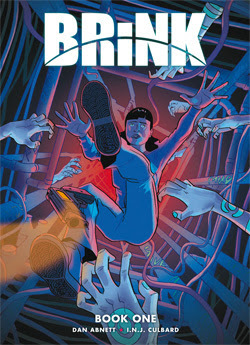 2000 AD have the first collection of Brink out this week! IN THE LATE 21ST CENTURY THE REMAINS OF THE HUMAN RACE ARE CRAMMED INTO the Habitats: vast artificial space stations; hotbeds for crime and madness policed by private security firms. When a routine drug bust goes wrong, no-nonsense Investigator Bridget Kurtis finds herself in a life or death struggle with a new sect of cultists. But evidence begins to point to something far more sinister going on behind the scenes… The first series of the new atmospheric, sci-fi thriller from Dan Abnett and I.N.J. Culbard.